Beef Shorthorn met a strong, level demand with bulls selling to a new October breed record top of 12,000gns and £5,121.00 average at the breed society’s official autumn sale at Stirling on Monday 23 October 2017. “A very firm trade throughout the sale resulted in an overall 13 bulls averaging £5,121.00, up £2,100 on the year with an 81% clearance, whilst demand for females continued to remain buoyant with 48 entries levelling at £2,890.00, trends that reflected the continuing demand for Beef Shorthorn as a functional suckler cow and attracting buyers at the ringside from as far afield as Cornwall, Sutherland and County Galway,” commented breed society president, Sally Horrell. Leading the trade at 12,000gns was the male champion, Grovewood Jackson, a dark roan two-year-old by Glenisla Explorer and out of a Tamhorn bred cow. Bred and exhibited by breed newcomer, Chris Mallaber, Drakelow, Derbyshire, he sold to Kincraigie Farms, Banchory, Aberdeenshire. Next at 9,000gns was the reserve male champion, Chapelton Jacob, TI +30, SRI +27 from DJ Biggar, Castle Douglas trading to GB Grieve, Fraserburgh, Aberdeenshire. A red two-year-old, Jacob was a Chapelton Emperor son and out of a dam going back to Cavans Yankee. A bid of 6,500gns secured Glenisla Kelpie TI +19, SRI +21, a roan 18-month-old by the 7,000gns Flight Lieutenant of Upsall from Major JPO Gibb, Blairgowrie, Perthshire. He went home with Aucheneck Estates, Killearn, Glasgow. Heading the females at 5,500gns was Millerston Augusta Julie TI +25 SRI +21, a two-year-old roan Meonhill Charlie Chaplin daughter and out of a homebred dam from Jack P Ramsay, Mauchline, Ayrshire to SG Mair and Son, Turriff, Aberdeenshire. Millerston Augusta Jewel TI +24, SRI +20, another same age and same way bred roan heifer sold for 4,500gns to Cherryvalley Farms, Crumlin, County Antrim. Cherryvalley were in the money for three more lots. They paid 4,600gns for the female champion, Cairnsmore Kirsten Averell TI +22, SRI +19, an 18-month-old by the 15,000gns Chapelton Dauphin from Mr and Mrs B Landers, Newton Stewart, Dumfriesshire. At 3,500gns, they secured the reserve female champion, the roan 19-month-old Glenisla Artic Storm daughter, Glenisla Desiree TI +27, SRI +25 from Major JPO Gibb, whilst their final 3,000gns investment was the reserve female champion, Shawhill Krystal, an 18-month-old white by the homebred Shawhill Freedom from Thomson, Roddick and Laurie, Lockerbie, Dumfriesshire. Lincolnshire breeder, A Haigh, Market Rasen offered the second leading female entry at 4,800gns to HG Murray, Bonar Bridge, Sutherland. Willingham Augusta Florence TI +30, SRI +18 was a 17-month-old roan by Willingham Humperdink. The red Elliot Surprise TI +15, SRI +13 secured a bid of 4,500gns and led a draft of two-year-old heifers in calf to Balgay Journeyman from J Elliot, Kelso. Sired by HD Swagger, she was out of a Shadybrook dam and sold to Melview Farming, Dymock, Gloucestershire. Two entries shared a 3,500gns price tag. First to go was the roan Elliot Eccles Lass TI +14, SRI +9, by CCS Equity’s Charmer. The buyer was I Tennant, Carluke, Lanarkshire who also paid 3,000gns for Elliot Starlet TI +7, SRI +2, a roan Alta Cedar Code-Red daughter. The second 3,500gns bid was made by Fiona Wilson, Peterhead, Aberdeenshire for Elliot Rawburn Lass TI +13, SRI +11, by Sull GNCC Salute. Coldrochie Grace Beauty J42 TI +20, SRI +13, a red and little white two-year-old by the 12,000gns Knockenjig Foremost made 4,200gns and headed a draft of heifers from MD McMillan, Luncarty, Perth. She sold to WJ and J Green, Fochabers, Morayshire who secured three more entries including the red Coldrochie Broadhooks TI +34, SRI +25, another two-year-old Foremost daughter at 3,500gns. Three Coldrochie heifers shared a 3,200gns bid. First to go was the 19-month-old Foremost sired red Coldrochie Secret Swift TI +38, SRI +27 to R Taylor and Sons, Fintry, Glasgow who also paid 3,200gns for the 17-month-old roan, Coldrochie Grace Beauty K36 TI +29, SRI +23 by the homebred Coldrochie Hank. The 18-month-old Coldrochie Catriona Rosebud TI +14, SRI +12, a red Garibaldi of Upsall daughter commanded the third 3,200gns bid from MA Robertson, Perth. Coldrochie Irania Rainbow TI +22, SRI +20, a red and little white 18-month-old by Foremost was secured for 3,000gns by A Stephen, Forres, Morayshire. Major JPO Gibb led his female trade at 3,800gns twice. The first call was made by Balnabroich Farms, Dundee, Angus for Glenisla Eva Broadhooks TI +22, SRI +21, a 19-month-old roan by Belmore Fuel Injected. The second 3,800gns bid secured the same age Glenisla Foxglove Tansy TI +18, SRI +20, a red and little white Flight Lieutenant of Upsall daughter for James M Hay and Son, Edzell, Brechin. Glenisla Strawberry TI +23, SRI +22, a 19-month-old roan by the 7,500gns Chapelton Glen Clova made 3,500gns to L Anthony, Galashiels. 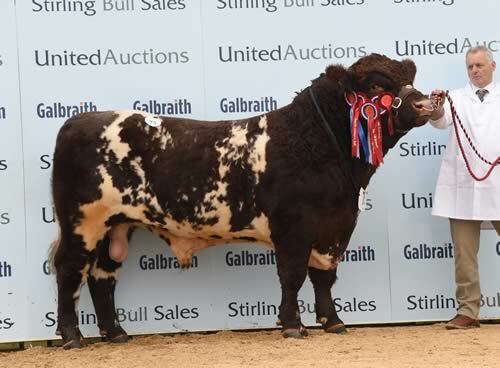 William Allan, Crossford, Fife offered his two-year-old, roan, in calf Chapelton Glen Garry Miltonlockhart Jamiroquai at 3,500gns to A and A Hamill, Crumlin, County Antrim. A draft from the GR Brooke Estate, Earlston, Berwickshire, was headed at 3,500gns by Lintonpriory Myrtle TI +23, SRI +20, a red two-year-old by Paintearth Rama. In calf to Balgay Journeyman, she went to R and J Byers, Brampton, Cumbria. Lintonpriory Hazel TI +19, SRI +9, a roan 21-month-old by the 13,000gns Chapelton Braveheart and due to Journeyman made 3,000gns to Libby Clark, Lurgan, County Armargh. Cairnsmore Krystal Gold Dust Alexis TI +14, SRI +12, an 18-month-old roan old by Ballylinney Gently from Mr and Mrs B Landers made 3,200gns to Ross Withers, Truro, Cornwall. The 19-month-old roan, Chapelton Wild Eyes TI +21, SRI +23 was amongst the day’s six, 3000gns calls and headed a draft from DJ Biggar. The buyer was J Fyall, Newmacher, Aberdeenshire. Averages: 13 bulls £5,121.00; 18 females £3,091.66. Drafts: Glenisla, 8 heifers £3,136.87; Elliot, 4 heifers £3,806.25; Lintonpriory, 2 heifers £3,412.50; Coldrochie, 9 heifers £3,208.33; Chapelton, 4 heifers £2,572.50; Fingask, 3 heifers £1,890.00; Wavendon, 3 cows with calves at foot £1,610; 4 heifers £1,181.25.